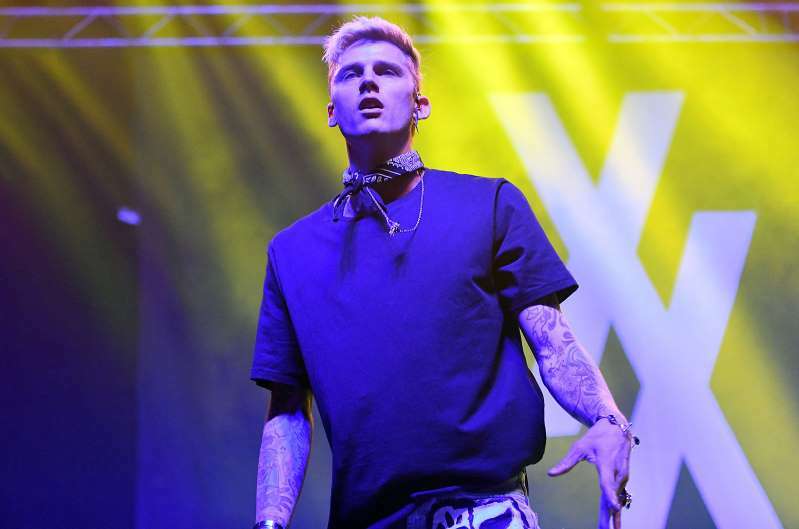 Machine Gun Kelly’s quarrel with Eminem is poised for another round after the 28-year-old rapper upping the ante with a new social post. The hip-hop artists have engaged in an angry back-and-forth since Em’s surprise album Kamikaze dropped Aug. 31, on which he delivered a flurry of MGK jabs on the song "Not Alike." That’s where things really heated up. Last week, Em sat for a candid chat with Sway Calloway and offered his “petty” reasons for hating on Kelly. And then, on Friday, he fired away once more with a brutal new track, “Killshot.” On it, Em goes for the knockout blow: "But I'm 45 and I'm still outselling you / By 29 I had three albums that had blew / Now let's talk about somethin' I don't really do / Go in someone's daughter's mouth stealin' food," he raps. It missed its target, MGK says. Late Sunday, the “Bad Things” rapper let it be known he hasn’t lost any swagger with an Instagram post that sees the artist with his back to a big crowd at the Amway Center and his middle finger raised. Just so there’s no mistake, Kelly’s shirt is emblazoned with the artwork of Em’s fiery new track, and he captioned the snap, “He missed,” along with the hashtags. #legshot #rapdevilstillNUMBERON.